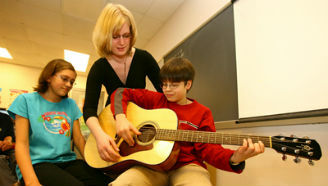 Through its mini-grant program, the Foundation helped buy twelve guitars for use in the music program at Transit Middle School in 2006.
projects, programs or activities that might otherwise not be possible because of limited school budgets. Since the mini-grant program began, the Foundation has provided over $20,000 to help support a broad, diverse spectrum of educational enrichment activities for Williamsville students. All grant applications are reviewed and considered by a selection committee of the Education Foundation Board, which then presents its recommendations to the full Board for deliberation and approval. Grants are announced and awarded in January.